Jamaica, a Caribbean island nation, has a lush topography of mountains, rainforests and reef-lined beaches. Many of its all-inclusive resorts are clustered in Montego Bay, with its British-colonial architecture, and Negril, known for its diving and snorkeling sites. Jamaica is famed as the birthplace of reggae music, and its capital Kingston is home to the Bob Marley Museum, dedicated to the famous singer. Whether you live on or near the island or you simply enjoy visiting, this Jamaica Island nautical chart makes great home décor and a perfect gift for boat owners. 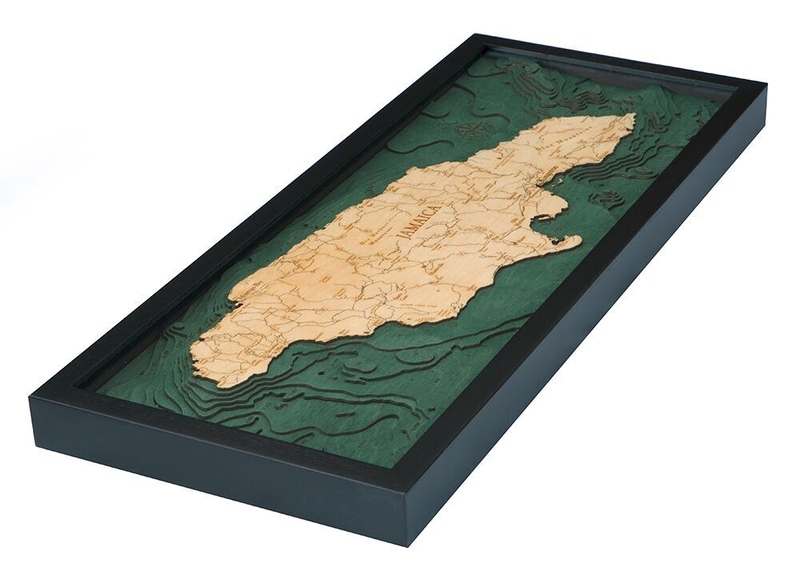 Our Jamaica 3D nautical wood map accurately depicts the shoreline and bottom contours of the island of Jamaica. They are carved in Baltic Birch wood, framed with solid wood, and are crystal-clear acrylic covered. Intricate detail is both carved and laser etched into the artwork to create realistic and attractive maps that show precise shorelines, depths, landmarks and lettering. Our own finishing techniques bring out the Baltic Birch’s natural grain. Order your Jamaica depth chart from Carved Lake Art today to get the most detailed chart on the market at the best price! Have a question? Get in touch! Carved Lake Art is here to help. The quality of the piece, including the framing is excellent. And the customer service is incredible! I ordered 3 different pieces for gifts and everyone LOVES them! I highly recommend them! Bought this as a birthday present for my husband, and we both LOVE it. It looks spot on to what is shown in the picture, and the detail is impressive! High quality craftsmanship. Also easy shopping experience: Many designs to choose from, and it arrived in the guaranteed window of time. Prices are on par with others I've seen.